← 20 Jokes That Only Intellectuals Will Understand. I wrote this review of The Parasol Protectorate Series by Gail Carriger for publication in the upcoming issue of the magazine The WOD. If you are familiar with my book and movie reviews, I am usually accused of being more of a critic than a reviewer. This time, you can experience my lighter side as I love this series. The problem you face when writing about a five book series is that you will obviously have some degree of spoilers as you explain the plot twists. If you mention a character in book three, readers of book one obviously knows they survived books one and two. As a result, I will discuss the author, series and quality first, then will have a big bolded all caps spoiler alert before we get into those types of details. As a steampunk author myself, I have always been a fan of the genre, even before I knew it was a genre. I grew up with Jules Verne and HG Wells stories, which at the time were simply science fiction written in the late 1800s. Today, if you write similar adventures that occur during the Age of Steam – roughly 1830 to 1900 – that have a science fiction component, they are referred to as Steampunk. The time period was thrilling because for the first time the labor of a man or a beast of burden such as an ox or horse were replaced by steam power. Factories, trains, urban pollution, cotton looms, steam ships and other devices were like landing on the Moon for the first time. The map of Africa was still blank in the middle and we were looking for the source of the Nile. The sun never set on the British Empire, the major powers jockeyed for empires, magic and science were hard to distinguish, and the United States had the Wild West, the Civil War and Indian wars. 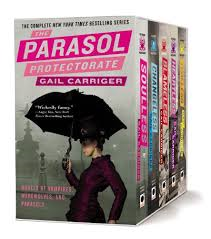 It is in this time period in which Gail Carriger writes her fiction series, the Parasol Protectorate. Gail Carriger is the pen name of Tofa Borregaard who holds three degrees including a Masters in Archaeology and a Masters in Anthropology. She has lived in both the United States and England and traveled enough to have a cosmopolitan view of things. Her training and experiences definitely inspire her style of writing. Gail Carriger has a very unique and clever idea in her first book Soulless, which introduces the main character, Alexia Tarabotti. Alexia is born with no soul, hence the name of the book. People with too much soul in her world might end up as vampires or as werewolves or even linger about for a time as ghosts. To be soulless is very rare and basically makes her immune to those with the abundance of soul and even able to remove their power temporarily with her touch. This concept alone is rife with conflict, but don’t expect the series to take you down the familiar path of vampires and werewolves seen in contemporary urban fantasy. 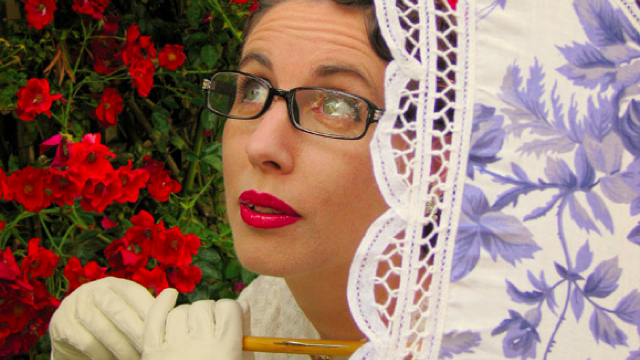 Instead, Gail Carriger is a master at weaving fashion, social morays, customs and humor into her novels. Her character development and whimsical narrative style are superlative, telling the story in such a charming and entertaining fashion that you have difficulty putting the books down. There is action, international intrigue, gadgetry and supernatural elements, but it is a world of fun, clothing choices and friendship, not a gory monster fest all too common in lesser literature. 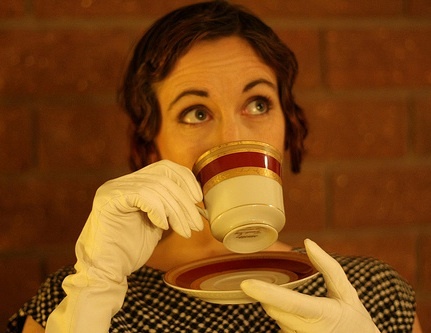 I am a huge fan of Gail Carriger, and in limited correspondence through emails and her Facebook and blog site, I am a fan not only of her writing, but of her as a person as well. You can stop here with no spoilers and rush out to buy all five books and read them. You will have a great time and be sorry when they are done. Gail will also be appearing at LepreCon 2014, May 8-11 in Mesa, Arizona. Be sure to come by if you are in the area and meet this outstanding author. Show your support if you are already a fan like me and queue up for the signatures for your books. SPOILER ALERT – Released in just 2009, Soulless is the first in the five book series. Alexia Tarabotti faces the challenge of being too tan and curvy due to her half-Italian heritage and suffers the further problem of being a well-read intellectual and opinionated woman in an era that does not always appreciate those qualities. She suffers her step family, focuses on fashion and spends time with Ivy Tunstell, the delightful but fashionably challenged best friend. Her soulless nature, though not well known, soon draws her into a world of intrigue with the werewolves, her friend the dapper vampire and the local hive, and even with Queen Victoria herself. As if that is not enough to deal with, she encounters a particularly annoying werewolf named Lord Maccon. In the second book, Changeless, we find Alexia married and now a noblewoman, the Lady Woolsey. Her husband is off on business while a pack of werewolf soldiers camps on her front lawn. Exorcised ghosts, an angry Queen Victoria and other dangers bring her all the way to Scotland to investigate matters and learn the truth about her own husband. There is a particular incident at the end of this book that is definitely a cliff hanger for the third in the series. In the third book, Blameless, Alexia separates from her husband in a scandalous way, even though she herself is – blameless. Lacking her husband, she is back with her scornful family, the Queen fires her from her position, and someone begins to send deadly clockwork devices after her to kill her. This is the one book I did not enjoy at first; neither did my wife who read along with me. The reason is that the first part of the book loses the whimsical style of the first two and creates a more real and tense situation. It almost had me put down the series, but having enjoyed the first two, I powered through this beginning. About a third through the volume, it regained the usual more light-hearted style as Alexia travels, faces challenges, and her personal problems start to be repaired. In the end, the third book is definitely worth reading and leads you on to the next two, but if I had to find a fault, it would be the early tone of the middle book. The fourth installment of the series is Heartless. Alexia must once again solve a sinister plot to kill Queen Victoria and delve even farther into the mysterious past of her husband. One of her sisters becomes heavily involved in the suffragette movement, while her cross-dressing friend Madame Lafoux is once again creating strange clockwork devices. This is one of the more intriguing books in the series because the characters are already strongly established, allowing the author to focus more on subtleties and interesting twists along the way. 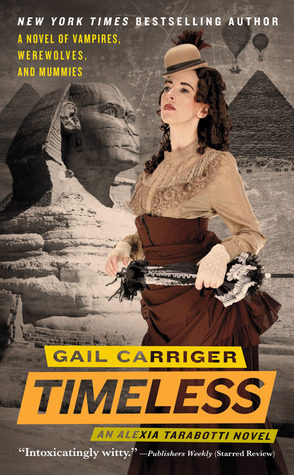 The final book, Timeless serves as a capstone and rite of passage for all the characters in the series. Alexia is now relatively settled in to her new lifestyle, when a summons is received from an ancient vampire leader in Egypt. This takes the reader off to the distant sands of the Nile Delta for more adventures with their beloved characters. In Egypt, when all is done, it brings a satisfying end to the series, having told Alexia’s main story of life challenges and passing the torch to several other characters known to the reader. As a fan, you sometimes want story series to go on forever, however, experience shows that telling a story too long causes some series to become ridiculous or forced. As it is, the Parasol Protectorate thoroughly tells the start to end story of Alexia while leaving the reader with a sense of satisfied completion. 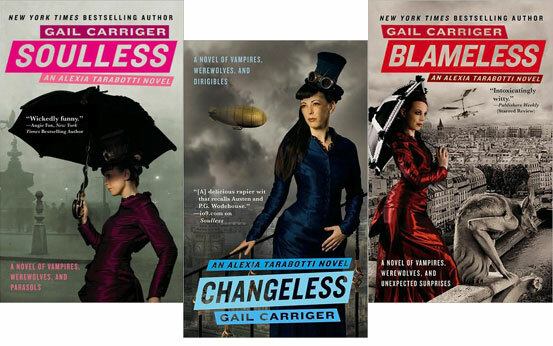 Congratulations to Gail Carriger for such excellent work in writing five such wonderful novels in this Steampunk series. 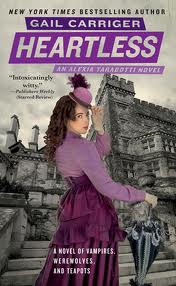 When I first started reading Soulless, I was told it was a “woman’s Steampunk novel” because it is from Alexia’s view and deals with fashion. I would totally disagree. I think everyone can enjoy the series equally. I also appreciate how it is written with wit, an eye to history, great characters and action, but never descends to being tawdry or bloody in place of good storytelling. I wholeheartedly recommend this series. I have read the first 2 of these and thoroughly enjoyed them, must get around to the rest soon!